When selecting a marine battery there are so many considerations. You cannot just check the price or the size of the battery. You likely also would want a long lasting battery that will perform well while you are out in the water. You do not want a battery to die down on you while you are out in the ocean. A deep cycle marine battery is definitely a great choice for your boat…. But is the Gel type deep cycle marine battery a better choice? 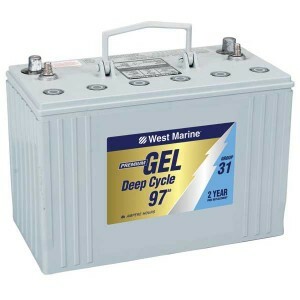 Let us take a quick review of gel deep cycle marine batteries. With a vast array of boats, the demand for different batteries also varies. And with the technological advancements that we have now, the products have caught up with the needs of boat enthusiasts. With the varying needs, it can be quite confusing as to which battery to choose. However, the Deep Cycle Marine Gel battery is actually one of the top picks for boat use. This battery is designed to power a load at long periods of time and reach very low states of discharge and then be able to charge right back up to full charge (here is our review of marine battery chargers). 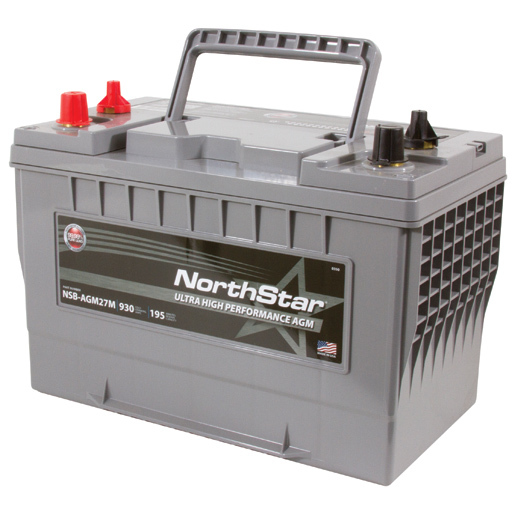 A particular 90 Amp hour gel deep cycle battery can run a 9 amp load for 10 hours. What’s good about this battery is that if you use it for starting your diesel or gas engine, it will give you the proper amp and not damage the battery. It is designed to also function as a starting battery. 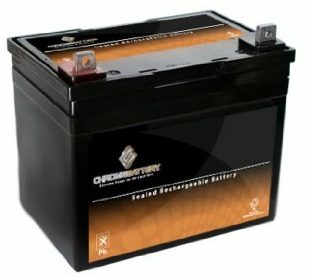 Another notable feature about gel deep cycle batteries is that they can be charged hundreds of times (about 400 cycles) before they reach the end of their life. These batteries are heavier than other batteries because they are loaded with lead for more power capacity. They can weigh from about 52 lbs – 137 lbs. These are one of the more expensive batteries in the market. This is highly recommended for the best performance in cycling batteries. Spill proof “leak proof” – It is best for use in boats because even if your boat battles waves left and right, your battery is safe from leaking lead acid. Overcharge resistant – overcharging the battery shortens the life of the battery. Deep cycle gel batteries resist overcharging even if you left them charging more than the prescribed charging time. Low self discharge rate – These batteries only discharge 1% capacity per month at 68 degrees Fahrenheit. This means you can keep them in your garage during winter without the need of putting it in trickle charge. Great cranking amp – it is also great for starting engine because it provides the ample amperage for sure starting. Gel batteries, as compared to flooded batteries, give longer trolling time. Maintenance free – they are practically maintenance free and you can just clean the terminals every now and then just to ensure that electricity flows smoothly. If you could only choose one battery for your boat, this is a perfect purchase. This can start your boat engine and also provide auxiliary power for your refrigerator, TV and whatever you have in your boat that needs electricity. Best for cycling applications! You can charge it again and again and again. Battery life expectancy is about 8 years after 400 – 500 cycles. This is ideal for using the battery and discharging it way down to almost no charge at all. This type of use is typical for a cruising sailboat or a power boat that spends a lot of time at anchor. 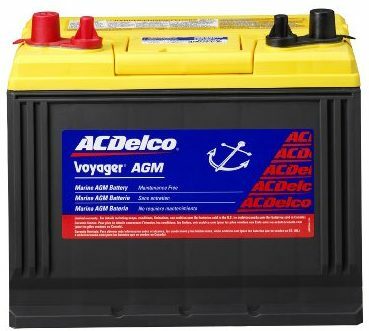 Although a bit expensive, it is one of the safest and most reliable marine batteries. If you practically want a maintenance free battery that you can leave over the winter without charging, this is the perfect battery for you. Here are the different types of deep cycle marine gel batteries. You should calculate the need of your boat according to its group, the CCA requirement, the MCA and the size. Check All Options Here. Deep Cycle Marine Gel Battery, Group 24, 73 Ah, 132 Res. Min., 410 CCA, 575 MCA, 10 7/8″L x 6 3/4″W x 7 1/2″H, 52lb. Deep Cycle Marine Gel Battery, Group 27, 88 Ah, 160 Res. Min., 505 CCA, 700 MCA, 12 3/4″L x 6 3/4″W x 9 7/8″H, 63lb. 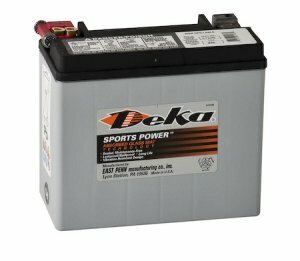 Deep Cycle Marine Gel Battery, Group 31, 97 Ah, 180 Res. Min., 550 CCA, 780 MCA, 12 15/16″L x 6 3/4″W x 9 3/8″H, 70lb. Deep Cycle Marine Gel Battery, Group 4D 183 Ah, 375 Res. Min., 970 CCA, 1245 MCA, 20 3/4″L x 8 12/”W x 10 1/8″H, 137lb. Deep Cycle Marine Gel Battery, Group 8D 225 Ah, 475 Res. Min., 1150 CCA, 1470 MCA, 20 3/4″L x 11″W x 10″H, 166lb. Deep Cycle Marine Gel Battery, Group 6V (GC2) 180 Ah, 345 Res. Min., 585 CCA, 850 MCA, 10 1/4″L x 7 1/8″W x 10 7/8″H, 68lb. Deep Cycle Marine Gel Battery, Group U-1, 31.6 Ah, 44 Res. Min., 200 CCA, 290 MCA, 8 5/16″L x 5 1/8″W x 7 1/2″H, 23lb.